Bepko and Krestan integrate theory and practice in describing the treatment of families with alcohol problems. Claudia Bepko and Jo-Ann Krestan are nationally recognized family therapists and experts in the areas of gender issues and addiction. Seeds of Hope Behavioral Svc. This book is ideal for understanding addictions in the family and the dynamics that play before, during and after sobriety. All though the authors don't focus on the causes of alcoholism but in the process that occurs in the family, they do mention factors that could potentially lead to alcoholism. This book is a hard read, and should not be rushed. The book is over 24 years old and is written from a feminist perspective if you can look beyond that it is a good book for clinical work for individual, family and group therapy. Heavily promotes Alcoholics Anonymous, Al-Anon, Alateen and other groups that help the individual to their own path of recovery and help to break the pride of both the alcoholic and co-alcoholic. 5.0 颗星，最多 5 颗星Psychology of alcoholic families - good read for all! This is one of those psychology books that may not describe any problem *your* family, but it tackles problems that will inevitably crop up in everyone's extended families, friends, coworkers, or lovers. It is a must-read for anyone that has had problem drinking in their family (going back to the grandparents) or dated anyone with problem drinking in their family, which means everyone should read it! This is the sort of information that must be more widely known to build healthier families and communities. The Responsibility Trap lets the reader understand such seemingly puzzzling questions as why do some men have such rage towards women? And why are so many successful "together" women so desperately attracted to one dangerous loser after another? 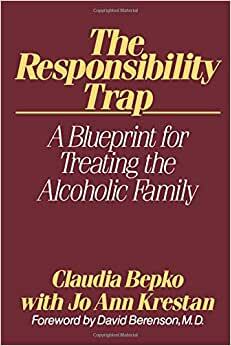 The Responsibility Trap is an engrossing description of how alcoholism effects the psychology of entire families. Although the book is very readable and uses a minimum of jargon, it is not a pop-pschology book, but a serious and thorough treatment of the subject. It endorses AA without rehashing the AA program. The serious focus of the book is shown by the short chapter directed towards counsellors about professional ethics. This book is only partly about addiction. It is mainly about the intergenerational patterns of alcoholism, power, and loss that drive people to SEEK alcoholic marriages. It also treats the alcoholic as part of a family unit that had usually had problems that led to alcoholism, and these problems remain after the drinking stops. A major focus of the book is the challenges that face families that remain after drinking stops, especially the "coalcoholic" (codependent) spouse that can't accept a sober partner. Because the book explains the alcoholic family's obsesssion with power and control ("overfunctioning" or "overresponsibility"), the transmission of poisonous attitudes from parent to child, and the unresolved problems that remain after sobriety, readers will also begin to see startlingly clear examples of alocholic behaviors in families where the problem drinking ended years earlier. The book also describes way children are molded by the alcoholic family to be overreponsible (calm, efficient, but lonely and filled with self doubt) or underresponsible (filled with rage, demanding constant care and praise, but filled with violent resentment towards anyone that helps them).As adults, overfunctioning and underfunctioning people feel an instant chemistry, but their relationship becomes an abusive dance with death that the seemingly "healthy" partner can't walk away from. A friend described this book as a frighteningly accurate account of their experiences, and the book provided more clear insights than they had obtained from years of counselling.